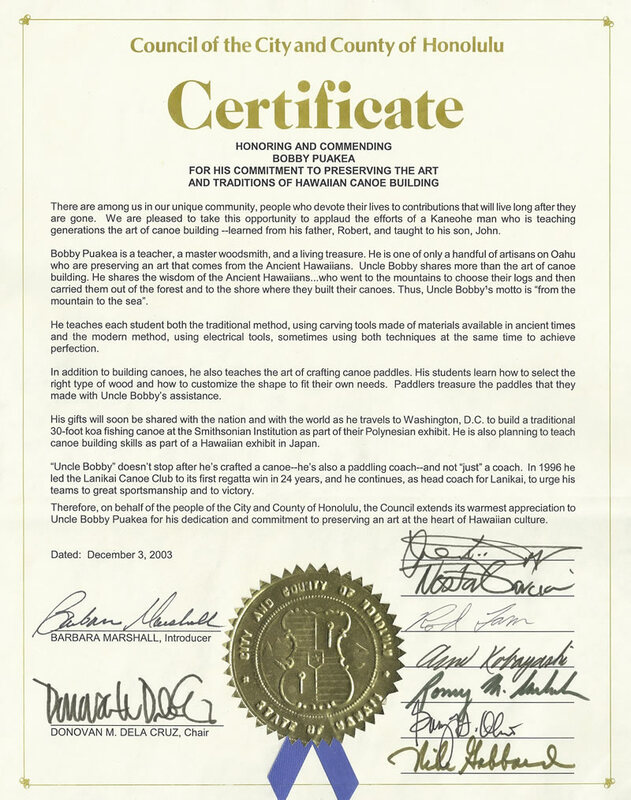 The Puakea Foundation of Hawaii was founded in honor of Bobby Puakea – known affectionately to us as “Uncle Bobby.” Please use the links below to jump down the page to read about the life and accomplishments of Uncle Bobby. Uncle Bobby is formerly the Head Coach at Lanikai Canoe Club on Oahu. He was awarded a lifetime membership in 1996 for his role in leading the club to many championship titles, including back to back wins of the Men’s Molokai Hoe and a course record. In 1996 in cooperation with the Hawaiʻi Community College and its project, Hana Pu Kalii (now known as the Hālau Na’au ao), Bobby initiated the art of canoe building in an institutional and educational setting. Halani is the completed canoe achieved through this project. Logs and support were provided by Keauhou CC and the Kamehameha CC in Hilo. Click here to look at photos from the project. He was awarded a special proclamation by the City and County of Honolulu in 2003. This certificate “honored and commended” Uncle Bobby for his commitment to preserving the art and traditions of hawaiian canoe building. Bobby also currently serves on the board of directors of the Kekua Foundation, and continues all of his canoe activities in addition to holding down a “regular” job! With his wife Pat, he has a large family of children and grandchildren too. Uncle Bobby was born In Hilo, and did a lot of growing up in Kona, around “three board canoes with an outboard” and iron roof canoes held together with a 2×4 on each end and tar scraped from the macadam roads! Throughout, he was watching 2, 3, and 4-man fishing canoes and 6-man racing canoes being built. Uncles Antone Grace and Charles Mokuohai, along with Frank Hendricks and James Yamasaki were all canoe builders from Kona in the early 1900’s to the mid-50’s. They were joined by Bobby’s father, Robert Puakea Sr, and James Kahooilihala from Hilo. Canoes built at that time (Papaloa, Kona, Naia, Honaunau, Malia, Kaimalino, Kaiopua Ua, Kai Elua, and others) were all 6-man racing canoes. Some of the fishing canoes that were long enough, were made into racing canoes with the seats rearranged. #1 was the front seat, and 2, 3, 4, and 5 between the iako (outrigger) and 6 at the stern. Robert Puakea Sr. and James Kahooilihala built their first racing canoe in Hilo during the 50’s. The canoe, eventually to be named Hilo Boy, was launched in 1956. Another racing canoe called Hilo Girl was also being built at the same time. It later was known as Kalanakila. These two canoes started Bobby on the road to becoming a “Kalai Waʻa'” (canoe builder). As Bobby’s father stayed active in canoeing, refurbishing, patching, or anything that needed to be done to keep the canoe alive. 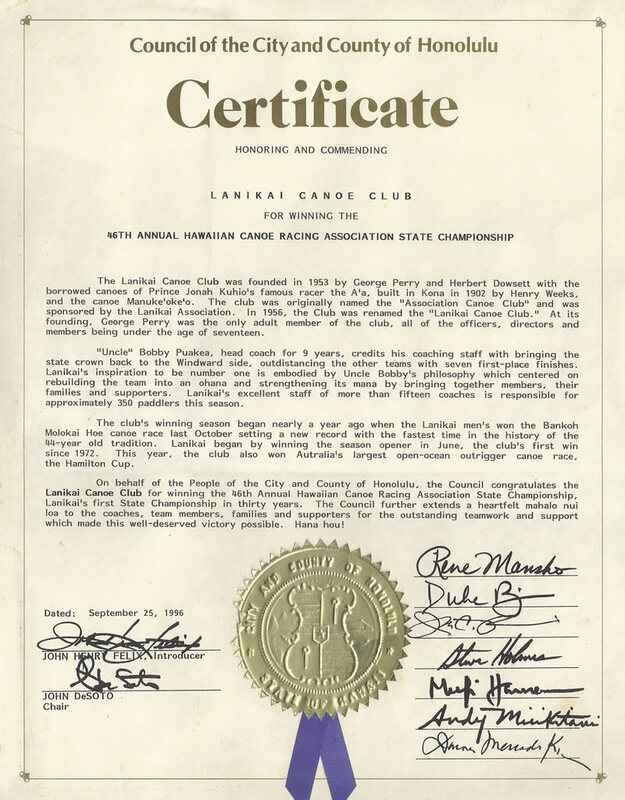 Bobby’s journey began, he says, in 1976 with the formation of the Koolau Canoe Club in Kailua, Oahu.